Bangham Conservation Park is a protected area in the Australian state of South Australia located in the state's Limestone Coast in the gazetted locality of Bangham about 45 kilometres (28 mi) north-east of the town centre in Naracoorte. The conservation park occupies land in section 4 and Allotment 1 of Deposited Plan 78796 in the cadastral unit of the Hundred of Geegeela which is bounded by the Bordertown-Frances Road on its western side, a road on its southern side and the Bordertown – Naracoorte railway line on its eastern side. As of 1992, access tracks had been constructed along the northern and eastern boundaries of section 4 while an easement for an electricity transmission line passed through the western side of the conservation park. The land originally gained protected area status in 1973, when section 4 was gazetted as the Bangham Conservation Park. In 2010, additional land consisting of Allotment 1 of Deposited Plan 78796 was added to the north side of the conservation park. 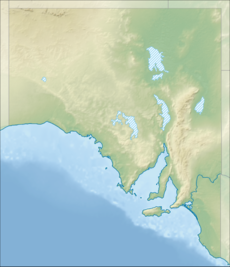 The land was offered in 1971 to the government of South Australia for conservation purposes. At the time, it consisted of 6.76 square kilometres (2.61 sq mi) of "native scrub" and 1.25 square kilometres (0.48 sq mi) of "cleared land" with the majority of the latter occupying its south-east corner. A subsequent study revealed that the land was used by red-tailed black cockatoos which at the time had "limited distribution" in South Australia and which made the land "particularly suitable for conservation purposes." (It) is characterised by an undulating plain of Tertiary sand with local ferruginous cappings overlain by easterly trending dunes and sheets of aeolian sand. Occasional sinkholes and small depressions are caused by solution of the underlying limestone. Soils … are generally bleached, deep acid sands with a yellow-grey B horizon. As of 1982, vegetation within the conservation park consisted of the following three major plant associations - a "open forest - woodland" of South Australian blue gum, river red gum in "areas subject to inundation" and a "open forest - low open forest" of brown stringybark. As of 1992, visitation to the conservation park was described as "low level of mainly local use with occasional visits from further afield by field naturalists and bird observers" and that no facilities had been provided for visitors. ^ a b c "Search result(s) for Bangham Conservation Park (Record No. SA0004486) with the following layers being selected - "Parcel labels", "Suburbs and Localities", "Hundreds", "Place names (gazetteer)" and "Road labels"". Property Location Browser. Government of South Australia. Archived from the original on 12 October 2016. Retrieved 24 December 2016. ^ a b "NATIONAL PARKS AND WILDLIFE ACT, 1972: HUNDRED OF GEEGEELA—BANGHAM CONSERVATION PARK CONSTITUTED" (PDF). The South Australian Government Gazette. Government of South Australia: 2968. 22 November 1973. Retrieved 21 February 2017. ^ a b "Protected Areas Information System - reserve list (as of 11 July 2016)" (PDF). Department of Environment Water and Natural Resources. 11 July 2016. Retrieved 14 July 2016. ^ a b "National Parks and Wildlife (Bangham Conservation Park) Proclamation 2010 [Published in the Gazette on 18 February 2010 at page 822]". South Australian Proclamations and Notices. Australasian Legal Information Institute. 18 February 2010. Retrieved 24 February 2017. This page was last edited on 10 January 2019, at 07:26 (UTC).